Swansea have completed a club record deal for Pablo Hernandez, just a week after landing Celtic star Ki Sung-Yueng for £5.5million. They have paid Valencia £50,000 more for the Spanish winger and the 27-year-old has four caps for his country and is a major coup for the Welsh side. 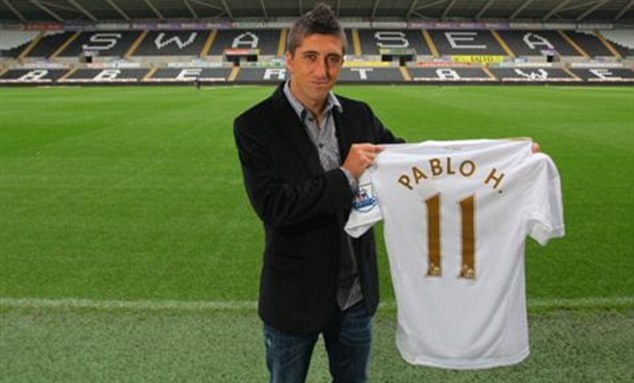 Hernandez revealed that Manager Michael Laudrup was the key factor in his arrival at the Liberty Stadium. He added: 'Michael was my idol when I was young. Then I was lucky enough to play under him at Getafe. 'I was a young player at Getafe and I learnt a lot from him. He gave me confidence and I have a lot to thank him for. 'Now I want to help him at Swansea in return, because he was very important for my career.